Shopping cart Shopping cart is empty. The services you will order (domain name registration, web hosting plans, SSL certificates) will be added in shopping cart. To complete your order, click on "Send order" button from shopping cart page. Information: How do I order? We offer free Magento eCommerce install directly from cPanel on any web hosting package (starting with Basic plan). For this, we develop a special cPanel Addon that allow any client to install and upgrade its virtual store with only few clicks. 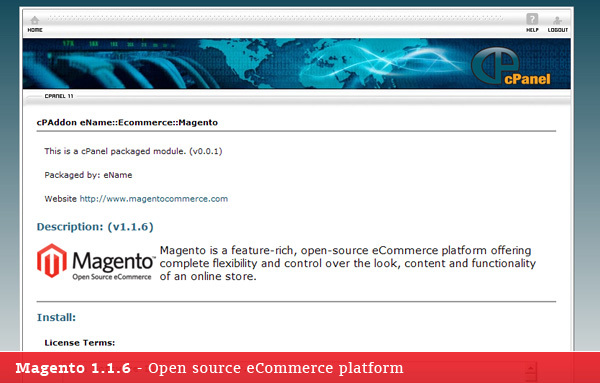 Magento Platform is created by Varien and romanian translation is made by users community. For a custom shop design we recommend TemplateMonster , Joomlart and MageSupport templates special created for Magento. You can connect Magento with online payment processors like Paypal or Authorize.net using free modules included. For connection with ePayment, the well-known romanian payment processor, we develop a special payment module that costs 150 EUR + VAT and a special partnership program. Please contact us for more details.